The FX609 is a Continuously Variable Slope Delta Modulation (CVSD) full duplex CODEC for use in consumer and commercial digital voice communication systems. 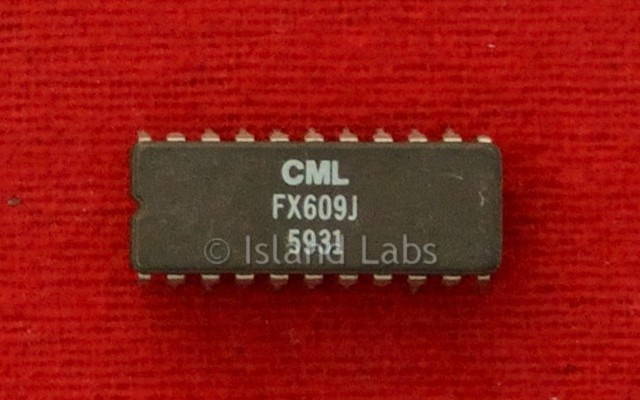 With its robust and selectable coding algorithms, low cost, very low power, and small size, the FX609 is ideal for use in a wide variety of consumer and business digital voice applications. Fully integrated CODEC simplifies design and eliminates costs, complexity and risk of external filters and software algorithms. 8kbps to 128kbps data/sampling clock rates are supported both via external clock signals or internally generated, programmable clocks. Internal data/sampling clocks are derived from an on-chip reference oscillator that uses an external clock crystal. An internal data/sampling clock output signal is provided to synchronise external circuits if desired. Multiplexer applications are also well supported by the encoder output’s three-state/high impedance enable feature. 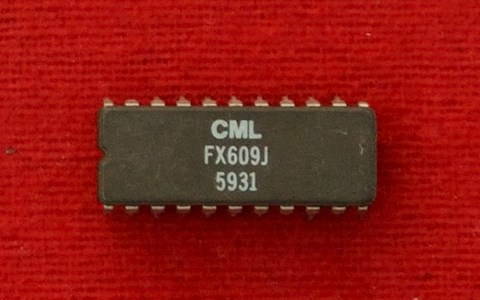 The FX609 operates from 5V supplies and is available in the following packages: 24-pin TSSOP, 16-pin SOIC and 22-pin CDIP. This unit is the ceramic one.